Due Diligence Complete: Rivals to Pounce on AOW Take Over Play? There’s nothing quite like the buzz of a takeover offer, or is there? As much as possible, oil stocks act as a proxy for, well, oil. 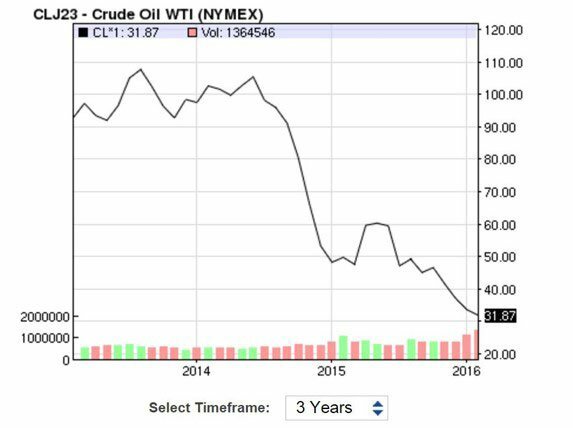 When oil goes down, oil stocks go down – it doesn’t take a shaman for that one to be figured out. 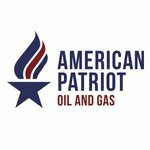 But American Patriot Oil & Gas (ASX:AOW), a company with limited production, has kept up its own significant pace this year. West Texas Intermediate – the main measure by which North American oil is measured, has gone from about $37 per barrel in early January to about $48/bbl since the start of the year – a rise of about 29%. Meanwhile, stock in AOW has gone up by 33% in the same period. That’s an excellent result considering the macro circumstances. So, how has AOW managed to keep an almost comparable pace? Well, when you have a 22c per share conditional takeover bid on the table, your share price is likely to hold up. What is piquing interest now is that Running Foxes Petroleum has successfully completed due diligence on its 22c per share offer. Running Foxes has checked AOW’s assets and analysed the leases and the books. It is now up to AOW shareholders to decide whether the offer is sufficient or whether this offer will encourage others to firm up their bids. AOW’s current share price (at the time of writing) is roughly 20c – meaning there’s a 2c or 10% differential between current offer price and current share price...with potentially more to come. Clearly the issue of 43 million shares at 14c each has had an effect here – providing a $6 million capital boost for the company but keeping a lid on the growth of AOW shares. Despite the bid, the numbers and the completion of due diligence, it is still important to seek professional advice when considering this stock for your portfolio – there are no guarantees in small cap oil investments. The 22c per share offer on the table may also be maintaining shareholder interest, or could it be that the market is starting to wake up to this company’s gameplan? And could it be now Running Foxes has completed its due diligence that better offers from rival bidders will come? In addition to ongoing discussions with the current bidder Running Foxes Petroleum, AOW is in discussions with a number of other interested parties. This is a company that has entertained not one but two bids for the company and its assets in less than six months. Not only that, it has a track record and succeeded in this type of play before with its first oil company Ambassador Oil and Gas where it was sold in 2014 to Drill Search following a bidding war with Magnum Hunter. 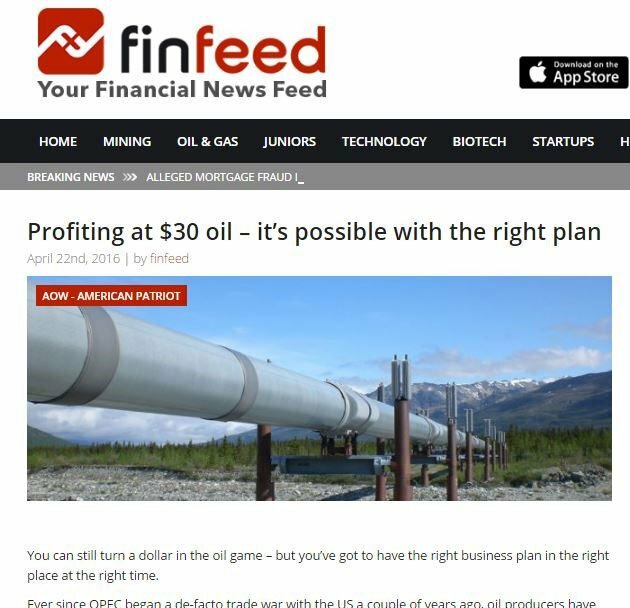 In this article we’ll take you through the plan and try to uncover how AOW keeps on doing what it’s doing – mainly by being one of the few oil stocks on the ASX which have the potential to turn a profit, even on $30 oil. 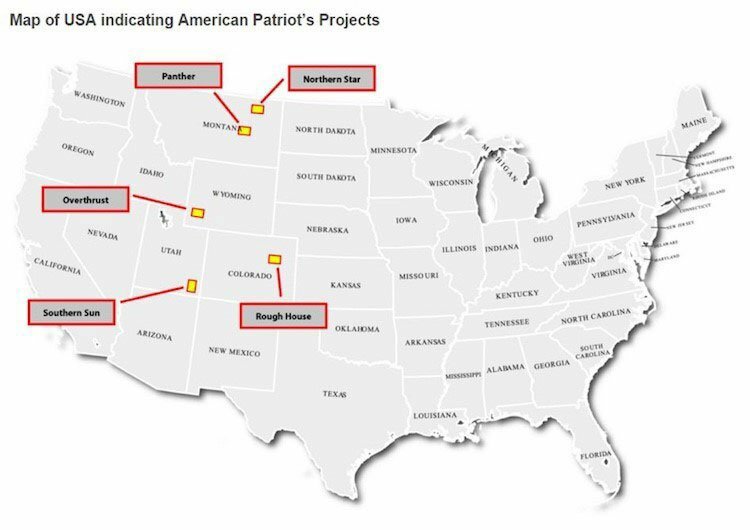 In what could be significant news for American Patriot (ASX:AOW) and its shareholders, Running Foxes Petroleum (RFP), AOW’s joint venture partner for its Rough House Project in Colorado, USA has successfully completed due diligence for its takeover bid of AOW’s assets. The due diligence process consisted of an extensive review of AOW’s property titles and lease acreage position. AOW’s Board is now considering the 22c per share offer and its major shareholders will be approached to determine their interest in the bid. The question is whether the offer is enough, particularly given previous interest in AOW’s assets. Remember this is a company that fielded two bids in six months. The other question shareholders will have to consider is whether the completion of the due diligence might encourage other players to firm up their bids. The Running Foxes bid isn’t the only interest. AOW is speaking with a number of other parties. No matter what happens with the offer on the table, it is fair to say that AOW has the power to determine its own future. So let’s take a look at how it AOW’s play came to the point. We’ll take you through the assets, but we just wanted to take a quick look at the overarching strategy AOW put into play to generate acquisition interest. AOW is a tiny company, and that’s not a dig. It’s a small company doing big things – and here’s the important part – on other people’s money. So, how do you pull off that trick? It’s a well-worn route in oil circles – mainly the value of the real estate play. Other companies may go after elephants, doing a whole bunch of work over a timeframe of years to try and become the next big producer. It’s a lofty goal, but it’s a huge punt to be taking. AOW is a touch more realistic, and knows to try and prove up a huge resource takes a truckload of time and money, which involves either loading up with debt or going to shareholders again, and again, and again. Enter the real estate play. What AOW does is identify patches of land with little work done on them, and happen to be next door to producing oil fields. It then acquires seismic and historical data on these patches of land for very little money, and packages it all up into a nice portfolio. From there, it’s time to go to market. AOW has a whole stack of data on land it’s picked up on the cheap and the surrounding oil producing land – and it takes this information to more established drilling companies. Given AOW is based in some of the oil heartlands of the US – there’s no shortage of drilling companies even at $40 per barrel. AOW asks the driller to drill wells in exchange for a percentage in the permit – and to pay for the drilling as well. This enables AOW to retain an exposure to the permit while letting its joint venture partner do the financial heavy lifting. So what assets and deals are underpinning the corporate interest in AOW? It has a tight five projects in the US, where it’s aiming to partner with JV partners to ensure that it doesn’t need to pay a cent for drilling – with those projects spread over four states in the western United States. So, let’s go through these – with a focus on its main plays the Northern Star and Roughhouse projects as its most advanced plays. Northern Star is a project where the interest has been so hot that it’s managed to bag not just one but two joint venture partners to the party. The first is with a company called Great Western Oil & Gas – a company which is essentially a vehicle for billionaire Pat Broe . Great Western currently produces about 2200 barrels of oil per day and has about 250 active wells – so it knows a thing or two about getting projects into production. Great Western has taken a 70% stake in AOW’s Northern Star project in return for cash, a free carry on two horizontal wells with no cash cap, and an option to drill two more wells. The first of those horizontal wells has already been drilled, with the first indicating that more testing work will need to be done before the second well is drilled – although early indications are of significant oil resource potential. Ideally the well would be a producer and AOW would be getting ready to put the well into production – but given that it’s not paying a cent on the well, no harm no foul. They’re targeting an area previously tapped by none other than ExxonMobil – which drilled 40 wells, tapping the conventional. Those wells were successful, but they weren’t ExxonMobil-scale successful – so the Supermajor pulled up stumps and went elephant hunting. What the partnership with Great Western is all about is trying to find the source of the oil in the conventional. As many oilers would know, where there’s a conventional pool, there’s quite often a deeper source rock – in this case the target is the Ratcliff Formation . AOW was willing to take that bet, and put together the plan including extensive well data and seismic. It then went to Great Western with the offer, and the rest is history. While Great Western is taking care of the unconventional, another company has joined up to take care of the conventional. AOW has done a deal with Anadarko Minerals, which just happens to have a project right next door to Northern Star’s 55,000 acres. 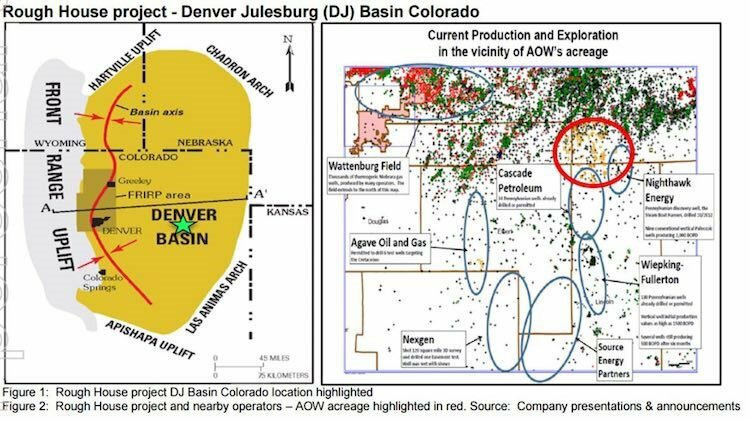 So, the strategy here from Anadarko is to have contiguous land holdings – but AOW doesn’t care about the strategy – just the deal Anadarko is able to bring to the party. Anadarko’s acreage features the Lustre and Midfork conventional fields, and it has about 17 prospects to chew on for a conventional program. A grand total of one well has been drilled by the joint venture to date, and that brought in production of 508 barrels of oil per day before choking back to 216. Please note thought that this is far from guaranteed, and oil exploration is a risky venture – investment caution is advised. Great Western is just one of the two heavy hitters for AOW. In Colorado, AOW is looking at the Rough House project, which is considered to be a conventional play rather than an unconventional one. The rule of thumb is that you potentially draw bigger volumes out of unconventional wells, but the wells cost more to drill – so it’s a risk/reward scenario. In any case, AOW managed to attract Running Foxes, its current bidder and another private company to the party. AOW managed to snag some seismic data for absolutely nothing – and package it up for the market. As you can see from the above, the best part of this play is that it’s a classic ‘nearology’ play, with plenty of production happening nearby. With the technical data and producers pumping out the crude right next door, RFP came on board with an offer to drill. It’s put up a five well commitment, with AOW to be free carried for two of those wells. AOW will then retain a 30% stake in the project, and put up 30% of the costs for the remaining three wells. One of the defining characteristics of AOW is that despite being a junior company in a space which is very much troubled at the moment – the strength of its business plan means suitors have come knocking. First cab off the rank for Mike ‘Tiger’ Davis, who lobbed in a $20 million offer for the company’s five assets in the US. AOW management, however, knocked that back. CEO Alexis Clark recently outlined to Finfeed.com that the reason it knocked back the deal was that it wasn’t a great deal for shareholders. “We rejected the first bid primarily due to the lowball opportunistic nature of the bid for the assets which we believe substantially undervalued the company assets and also the fact the bid was made at the asset level,” Clark was quoted as saying. This is clearly a company looking out for its shareholders rather than taking the first exit on offer in a volatile oil market. They could be forgiven for doing that too, given that there’s no guarantee of other offers coming in. From its joint venture partner, in fact. Running Foxes put up a 22c per share bid, with due diligence now complete, which effectively values the company at over $35 million. In fact, for anybody who bought AOW at current levels of 20c per share, accepting the offer would represent a 10% exit – however there is the potential of rival bids given this company’s track record to date. There’s no guarantee RFP have to follow through with the offer though given it is conditional , so take that into consideration before deciding whether or not to pile in. As we indicated, there’s also the possibility that a rival bid could emerge, particularly now RFP has completed all the hard work. While news is thin on the ground on discussions with potential rival bidder, the signs are that AOW are courting discussions with a few interested parties. AOW says as part of its disclosure to the market that it is in discussions with a number of other parties. That’s not tyre-kicking, that’s actual discussions. Even if it’s all for show, RFP could catch wind of the talks (US oiler circles being what they are) and come back with an improved offer. Whatever the case may be, we’re confident the management of AOW knows how this dance plays out – because this ‘ain’t its first rodeo’. As you’ve probably picked up on by now, this isn’t your regular oil and gas play. Instead, this is a real estate play aimed at generating a quick and profitable exit for shareholders. At the core is a business plan which involves using other people’s money – which is nice work if you can get it. It works up the technical details of its real estate, promotes the opportunity to a cashed-up driller and sits back and waits for the driller to do the hard work. Should the drilling come off, then it will have no trouble raising cash to get its projects into production as it can literally take drilling results to the bank. But it’s also working on another level. It puts this business plan into place, and then shops around itself to cashed up buyers. The offers from Mike Davis and Running Foxes are evidence of the strategy paying off. It’s also ground that the management at AOW has trodden before. Many of the people involved in setting up AOW were also featured prominently in a company called Ambassador Oil & Gas, which focused on one permit in the Cooper Basin (on the border of South Australia and Queensland). What it did is get its foot on PEL 570, worked up the technical detail on the permit and then shopped around the opportunity. It made good on that ambition, luring New Standard Energy (ASX:NSE) to the party – with the cashed up driller taking a controlling stake in the permit in return for Ambassador getting a free carry on the drilling. So, much in the same way AOW is doing today, Ambassador got to sit back and relax while the joint venture partner did all the hard work. In the Ambassador days, the Cooper Basin was a hotbed of M&A activity, and much in the same way AOW has fielded offers now – Ambassador did back then. Cooper Basin player Drillsearch (ASX:DLS) and American outfit Magnum Resources emerged from the woodwork and started an all-out bidding war for Ambassador. Drillsearch eventually won the shootout with a deal which valued Ambassador at $48 million, and we get the feeling this is something AOW is trying to manufacture again. The team at AOW could be trying to source another public bid, therefore putting pressure on its joint venture partner to come back with another offer. That’s all speculation on our part and it should not be used as a guiding principle for your investment – better yet, stick to the golden rule and do your own research before investing. The plan here is a pretty simple one – build up a suite of assets it doesn’t need to pay for to develop, catch the eye of a cashed up driller to finagle a deal, exit the investment at multiples of the entry price. With due diligence now complete, AOW and its major shareholders must decide whether the 22 cents bid put on the table by Running Foxes is worth accepting. 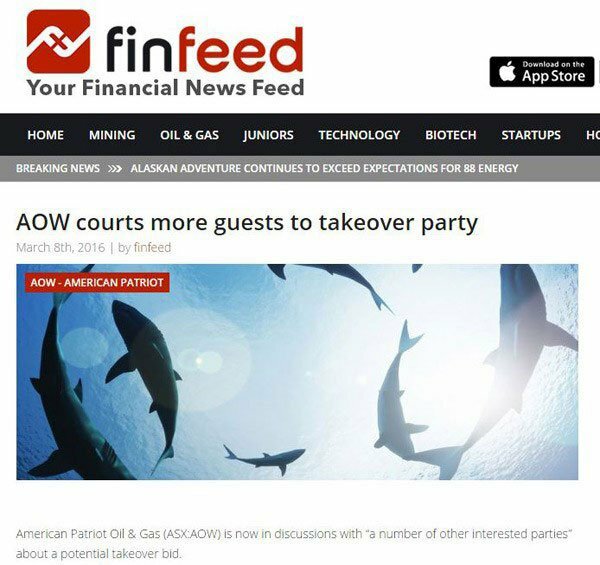 The management team at AOW is currently talking to a raft of players including its major shareholders about its next move. It’s all corporate intrigue, but the one thing that’s clear is that despite all the manoeuvring, AOW has built a solid proposition in its own right. With a firm takeover offer on the table at 10% more than AOW’s current share price, it’s clear the ASX is still waking up to this stock. Regardless of whether another offer comes in or AOW accepts the RFP bid, AOW has built a business based on the idea that other people should pay for the drilling. If you can swing that, you’ve done well. Whether the RFP deal is accepted or not, AOW’s position moving forward is solid, especially considering we featured only two of the projects AOW is working on because quite simply those are the most advanced. AOW has three other projects in the pipeline. Those remain undiluted, so even if you strip the takeover talk out of the equation there are catalysts to be had here as AOW tries to lure drillers to those three extra projects. If AOW is able to flesh out a plan for those three assets, then we could start to see the company emerge as an oiler in its own right rather than straight up takeover bait. For the moment all eyes are on AOW and its shareholders to see how it responds to RFP’s offer.